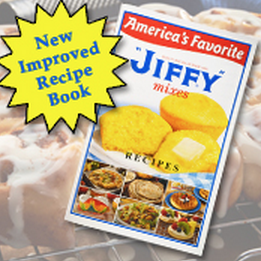 Get a FREE Jiffy Mix Recipe Booklet when you complete the short form! This is a new and improved booklet, which includes many new and updated recipes along with some of their old time favorites, such as Jiffy Chocolate Chip Cookie Mix, Jiffy Oatmeal Cookie Mix and Jiffy Sugar Cookie Mix. Allow 4 weeks for delivery!